Downtown Vancouver Full Service Vet!! Wish your vet practice was featured here? Click to list! Click to take this top spot listing! 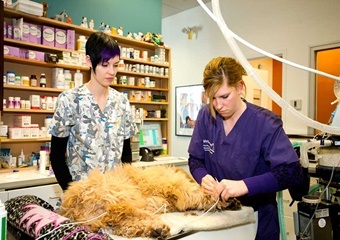 in the exciting and vibrant neighborhood, this vet clinic has flourished and expanded to its present location, serving its customers with quality veterinary services for reasonable prices in the downtown core of Vancouver. Yaletown has a fully-equipped surgical suite, where their doctors perform everything from minor lump removals to exploratory procedures and orthopedics. They also practice complementary medicine, integrating conventional (western) medicine with traditional chinese herbal medicine, acupuncture, laser therapy, and homeopathy. They have a convenient boarding facility for cats, with 11 cat condos to accommodate your kitty's boarding needs and activity level. Yelp Review: "The veterinarian was great with our cat, gentle and reassuring...he didn't even meow when he got his shot! The pricing was very reasonable. Also, I thought it was really great that they called the next day to see how Weasley was doing after his rabies booster. Great vet clinic!" Wish your pet friendly veterinarian was featured here? this ad space is available.